Breacachadh Castle was built in the early fifteenth century by the first Maclean of Coll and they lived there until the 1750s when Hector Maclean of Coll built a mansion, now called the new castle of ‘Breachacha’. The Macleans sold the island in the 1850s to the ancestor of Kenneth Stewart, the last laird of Coll. The old castle gradually deteriorated, and was abandoned as a picturesque ruin on the shore of Loch Breacachadh. The castle comprises several buildings. The original was a towerhouse with a curtain wall and a round tower in the diagonally opposite corner of the wall. Various stages of renovation then took place. 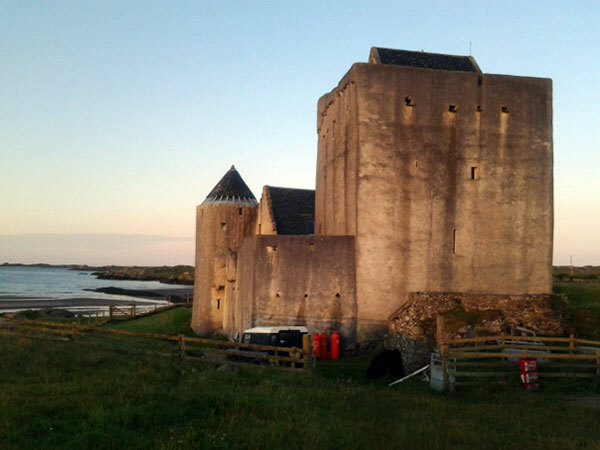 The main ones were in the 1590s when Macleans of Duart captured the castle. On their departure, the laird at the time, Lachlan 6th of Coll , rebuilt parts which the Duart Macleans had attempted to pull down He was responsible for the dramatic spiral staircase in the towerhouse. In the 1680s a house was built within the curtain walls. It is known as ‘the New House of Breacachadh’ and now consists of a library, hall and kitchen. In 1961 it was purchased from Kenneth Stewart by Captain Nicholas Maclean-Bristol of The King’s Own Scottish Borderers, a descendant of the senior cadet branch of the family of Coll. He and his wife Lavinia over thirty years restored the castle. It is rarely open to the public, but occasionally small groups are taken round by Nicholas and Lavinia personally. The castle is not suitable for anyone who cannot climb a steep spiral staircase or cope with low doorways. Flat shoes are essential. It would be very difficult for very small children. To keep the intimate atmosphere of this family home, a maximum of twenty four persons each afternoon will be invited to visit. Refreshments will be provided at the end of the tour, when there will be a chance to talk to Nicholas and Lavinia about restoration and living in this amazing building. Interested parties are asked to book in advance.